Babel is an animated epic fresco, which tells the story of two characters, their personal lives against the backdrop of China’s historical progression, from rural to urban. Produced by Studio Hdk Productions based in Paris. At one point the main character travels by train, the landscape transforms from a medieval rural village setting to where he arrives, in the future. It was filmed in Shanghai, but most work was done behind the computer, compositing. This epic collage is a must see. You can watch the full length 15 minutes here. 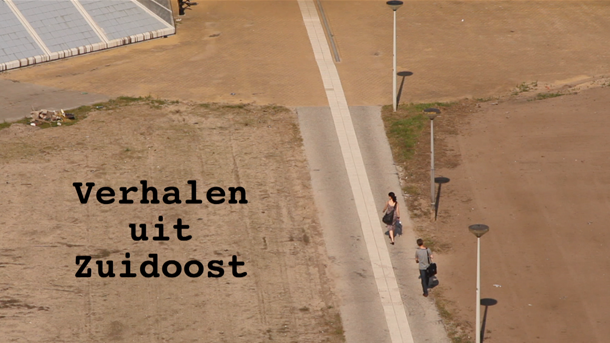 Also watch the director Hendrick Dusollier get interviewed in the following video. 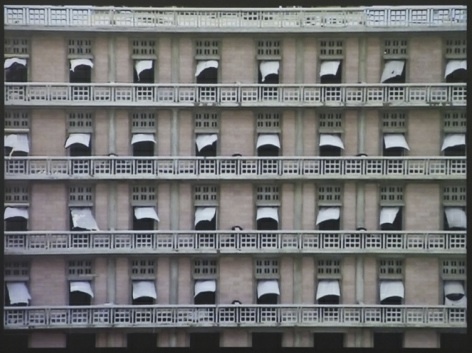 Beirut shows the windows of the hotel in front of which Rafik Hariri was assassinated by a car bomb in 2005. The video was shot secretly in an area that was under the armed protection of the United Nations. The peacefully fluttering white curtains of the empty hotel are in sharp contrast to the sounds of explosions and sirens heard in the background; we are suddenly confronted with the experience of war. As if highlighting postwar regret, oblivion, and the desperate repetition of war, the video is played in a loop, creating a vicious circle. 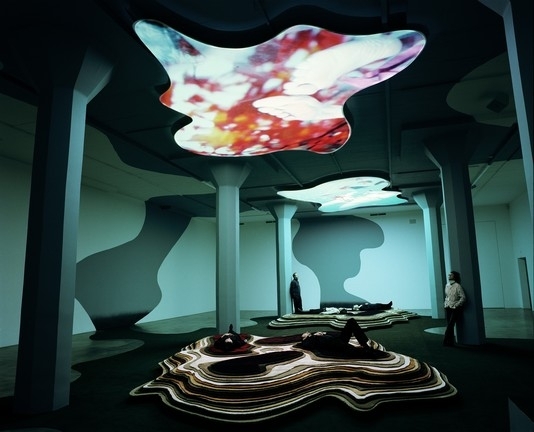 Visual artist, Pipilotti Rist, produces intriguing video installations. Her installations are so very big and very present which invites the public to become part of it. The human body, gender and sexuality are topics which play an important role in her work. The images portrayed of bodies and fruit are captured by fish eye close-ups and are composed of bright colours which gives her work a dreamy effect. In 2009 I had the opportunity to visit a solo exhibition of her work, ‘Elixir: the video organism of Pipilotti Rist’, in Museum Boijmans van Beuningen in Rotterdam, the Netherlands. I can imagine that people don’t get bored easily when watching her work. Usually it is a video-loop, a film of a couple minutes endlessly repeated, that you could easily watch for an hour and become obsessed by it. I felt a comfortable welcome in most of the exhibition rooms. For instance, one of the rooms was made up of islands of carpets to lie on and one could watch the film projected on the ceiling.